Social media have the potential to offer important benefits for patient education, support, and shared decision making. Despite the proliferation of social media use during the past decade, little is known about the scope and quality of available information, or the purposes that social media sites serve for patient decisional and support needs. 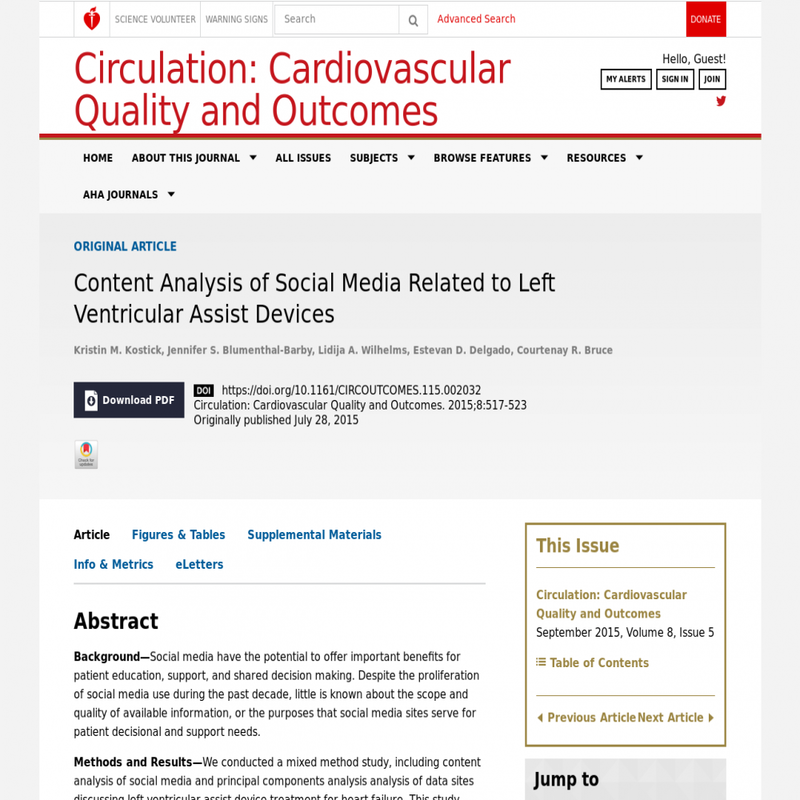 We conducted a mixed method study, including content analysis of social media and principal components analysis analysis of data sites discussing left ventricular assist device treatment for heart failure. This study explored aspects of interactivity, user-friendliness, appeal, medium, purpose, audience, and accuracy of information. Higher levels of interactivity (eg, posting comments) seem to enhance the appeal and usability of available information but also introduce greater potential for inaccuracy and inconsistency. The current lack of oversight into the content and quality of available information constitute a challenge for the reliable use of social media as forums for information-seeking and social network-based support. We conclude that social media outlets constitute a promising source of informational and psychosocial support for patients, caregivers, and candidates, and if used in conjunction with patient-provider dialog, can contribute to informed decision making by facilitating reflection and discussion of personal concerns, values, and informational needs.